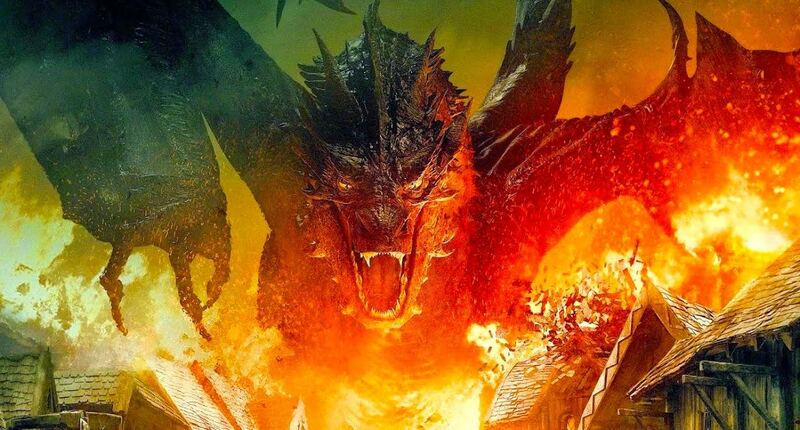 Bilbo is able to escape the Lonely Mountain with the object he was sent to steal from Smaug, but the result was a very angry, rampaging dragon who flew directly to Lake Town to wreak his fiery havoc. As Lake Town burns, the people fleeing and shrieking in terror, Smaug rains down more fire from above, virtually invincible to all human defensive weapons… except for one. There is an iron black arrow, which, if fired directly into Smaug’s heart through a missing armor scale on his chest, will kill the dragon immediately. As it happens, one man is able to aim and fire the black arrow perfectly, bringing down the dragon and killing him, saving Lake Town. At no time did the man who shot the arrow, being one Bard the Bowman, stop to ask Smaug if he believed in black arrows. Bard shot the arrow, and Bard destroyed the dragon. And such it is with the Bible. It is the black arrow that slays the dragons of human unbelief and satanic schemes. Our job is not to sit down with the dragon to show him the sharpness of the point on our arrow. We don’t seek to demonstrate complex mathematical formulas proving the inflexibility of the molecular iron crystal, or the force of a flying arrow when encountering a dragon’s skin. No, we fire the arrow by a trained and true aim, knowing how to use it, and it does its own work upon connection. And this is the difference between treating the Bible as the power of God unto salvation versus treating the sinner’s mind and will as the power of God unto salvation. Sinners do not decide that the weight of evidence for Jesus’ resurrection is sufficient to place one’s faith in His gospel. Sinners do not have faith. Faith is a miraculous gift that God gives to one who is under the preaching and proclamation of His Word! Preach the Word! It’s not just another textbook waiting for an expert’s explanation before it can be made powerful–no, it is powerful, awaiting the working of the Holy Spirit to make it effectual in a sinner’s heart. Preach the Word! Don’t wait for a sinner to give you the nod, the wink, or the friendly signal that they are ready to hear the evidence for the Bible. We must believe that the arrow will slay the dragon, and fire it. The results are up to God. Preach the Word! We do not lay aside the black arrow and pick up the butter knife of human reasoning and arguments over the probability of a resurrection. No, No, No!!! Remember, no one is the judge over God and His Word. Every man and woman must come before the judgment seat of Christ, not the other way around. Now, go and listen to my most recent episode of the Citizen of New Jerusalem podcast, where I respond to Craig Parton, who argued that carefully convincing dragons on the sharpness of our arrow is the best way to slaying them. This entry was posted in Apologetics, Evangelism, Podcast, Reformed Theology. Bookmark the permalink. Speaking as a non-believer, I have to say that I find your analogy here to be more than a little puzzling. An arrow, it is true, will pierce its target’s heart even if the target does not believe that the arrow is sharp. That does not seem to be the case with the set of written documents contained in the Bible, however. In order for the written word to affect a person, that person must first believe those words– at least, in some sense. The person must at least believe that those words carry something meaningful particularly to and for that person. It seems fairly ludicrous to assert that the written word can affect someone who sees no reason to pay any regard to that written word. In my case, I actually have quite a love for the Bible– though certainly not in the same way that believers do. I thoroughly enjoy reading the documents it contains, attempting to understand the cultures in which they were written, and learning about the stories, histories, legends, parables, and ideas which they recount. I love reading the Bible in precisely the same way that I love reading Diogenes Laertius. While I quite enjoy learning as much as I can about the ways in which the Greek philosophy cults operated and understood the world, I am not likely to adopt their religions for my own practice. In exactly the same way, while I love to read the Bible, I see absolutely no value in adopting the beliefs which it advocates. The Bible, it seems, is not like an arrow. No matter how often it strikes me, it simply does not seem to have the power to pierce my heart. Really glad you commented. Allow me a little room to elaborate and to seek to create an understandable response. The fault may be entirely with me if we aren’t communicating well, but bear with me. 1) The Word of God is the communication of God, and accomplishes what He wishes, when, where, and how. This is the very first premise of Scripture after beginning with God Himself–He is introduced in Genesis 1:1, and He begins creating the world by speaking. His Word is the active work of His omnipotence, in other words. 2) The Bible defines the doctrine of God’s will in regard to human response. As you said, “it seems fairly ludicrous to assert that the written word can affect someone who sees no reason to pay any regard to that written word.” Please note that throughout the Bible, people hear the Word of God and do not heed it. The reason for that is also given: “And the LORD hardened Pharaoh’s heart, and he did not listen to them, just as the LORD had spoken to Moses” (Ex 9:12); “Render the hearts of this people insensitive, Their ears dull, And their eyes dim, Otherwise they might see with their eyes, Hear with their ears, Understand with their hearts, And return and be healed” (Isa 6:10); “37 But although He had done so many signs before them, they did not believe in Him, 38 that the word of Isaiah the prophet might be fulfilled, which he spoke: “Lord, who has believed our report? And to whom has the arm of the Lord been revealed?” 39 Therefore they could not believe, because Isaiah said again: 40 “He has blinded their eyes and hardened their hearts, Lest they should see with their eyes, Lest they should understand with their hearts and turn, So that I should heal them” (John 12:37-40). ; and especially note what Jesus says in prayer: “I thank You, Father, Lord of heaven and earth, that You have hidden these things from the wise and prudent and have revealed them to babes. 26 Even so, Father, for so it seemed good in Your sight. 27 All things have been delivered to Me by My Father, and no one knows the Son except the Father. Nor does anyone know the Father except the Son, and the one to whom the Son wills to reveal Him” (Matt 11:25-27). I could cite more examples, but I hope that will suffice–from Old to New Testament, the Bible shows us that God judiciously hardens the hearts and blinds the eyes of people who do not love Him. This usually evokes the response: “that’s not fair,” or “then why would I be responsible for not believing?” The truth is, we are completely culpable for hearing and believing the Word of God, but because He granted us a will of our own with which to make decisions, we had the potential to rebel and not listen. God “baked it into” His relationship with humanity, but the converse is that when we do not listen, God has every right as our Creator and Lord to judiciously harden us, and to give us over to our illusion of self sovereignty, or autonomy. This condition is indeed the chief malady of humanity, especially the wise and privileged, like you and I.
Jesus in fact held the Jews responsible for rejecting Him as Messiah, because the written Word had been sufficiently clear regarding His coming/identity/etc., so that their rejection was a fully culpable act, and yet, Peter says “Men of Israel, hear these words: Jesus of Nazareth, a Man attested by God to you by miracles, wonders, and signs which God did through Him in your midst, as you yourselves also know— 23 Him, being delivered by the determined purpose and foreknowledge of God, you have taken by lawless hands, have crucified, and put to death” (Acts 2:22-23). See that? The men did the murdering by their own wills, but God foreordained it such that it would most certainly happen. God governs our responses to His Word, in other words, such that when we reject it/Him, He has given us over to doing what we desire, but when one responds in faith to His Word, He has actively intervened to grant a new heart, with a new moral nature, so that that person has then the capability and desire to believe in Christ Jesus for who He is, and what He has done. 3) Now with all that said, the other (and related) issue for you is perhaps you have approached the Bible improperly, as if it were just another library of ancient musings, like you said above. Look carefully at vv. 22-23. Paul shows how Jew or Greek rejects the gospel, but then in v. 24, the “called” of both types hear and believe. So there is a kind of miracle–“the call”– that awakens a living faith once seen as foolish or scandalous to the believing person. If, therefore, one approaches the Bible as its judge, to see if it is worthy to be believed as being a supernatural revelation of the one, true, living God, then that person, in his perceived wisdom, will fall into a snare. The text literally becomes foolish looking–you have to catch this–the Bible actually can change appearance according to the state of the reader. The objective meaning does not change, I should say, but the subjective experience of the reader is of receiving the Bible according to God’s judgment of that person, whether for good or ill.
4) So the whole point of the black arrow analogy is that the Bible does the work God intends it to do, every time. Whenever someone’s eyes are opened to the supernatural, unique reality of the Bible, it is a gracious act of God, one which that person had no faith or merit to incite. It is literally a rescue from death that has taken place. 5) The entire Bible is about Jesus, from Genesis 1 through Revelation 22. Luke records “beginning at Moses and all the Prophets, He expounded to them in all the Scriptures the things concerning Himself,” and “These are the words which I spoke to you while I was still with you, that all things must be fulfilled which were written in the Law of Moses and the Prophets and the Psalms concerning Me.” 45 And He opened their understanding, that they might comprehend the Scriptures” (Luke 24:27, 44-45). So you see, to understand Scripture is to see Jesus Christ for who He truly is, the uncreated, eternal and living God who became man. The entire narrative of the Bible is centered on Him, from start to finish. Every segment of Scripture somehow relates to Him, whether directly or indirectly, and sometimes explicitly. He in fact shows up in the Old Testament many times as one of the speaking characters in the narratives (cf. Joshua 5, Judges 13, and more). By the time He is born, lives, dies, and is resurrected, the book has been preparing us for Him for thousands of years. That is God’s Word: a self revelation to a cursed, sin-saturated race made in His image. We do not recognize Him in His Word, nor did we when He was standing among us in the flesh. Our desire to be God, and to dethrone Him has wrought a total spiritual blindness that can only be remedied by seeing Christ Jesus in all of Scripture, asking with a humble heart for forgiveness for having treated God and His Word as a light thing. I cannot keep you all night with an extended demonstration of this fact–I know you will want to reply and respond, so forgive me for going on at length.